Kathie applying tape at a kinesiology week event. Are you interested in learning more about kinesiology tape? I knew your answer would be - yes! I asked my intern Amanda (from the Guelph Humber Kin program) to do some research for us which you can read below. Thanks Amanda for putting this great info together for us! Kinesiology Taping was developed in the 1970’s, and over the last couple decades, this method has evolved greatly. It is a common treatment for athletes, physicians, and the general population. Many trainers and coaches have used various techniques of tape to treat injuries, provide protection, and support joints or muscle during movement. Kinesiology Taping has been a functional component in sport and physical rehabilitation. Areas that have used kinesiology tape as a treatment method include cerebral palsy, degenerative neuro-muscular disorders, multiple sclerosis, post mastectomy, and post stroke recovery (Mobility Therapeutic Tape Course Material, 2017). So how exactly does Kinesiology tape work? When an injury occurs, trauma causes blood to build up which exerts pressure on pain receptors under the skin. The elasticity in the kinesiology tape gently lifts the skin, creating a microscopic space between the skin and the tissues below. 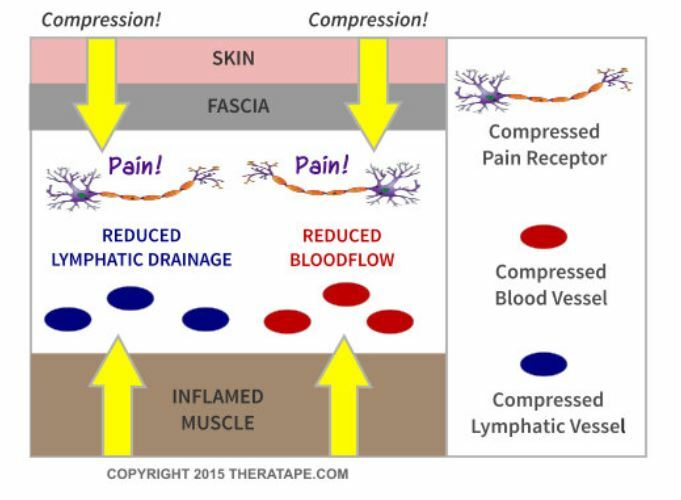 This allows the lymphatic vessels to open and drain excess fluid which will reduce the pressure on the pain receptors. Kinesiology taping is an alternative to athletic taping to support the fascia, muscles, and joints. Unlike stiff athletic tape, Kinesiology tape allows for unrestricted range of motion and is designed to mimic the approximate thickness and weight of skin (Mostafavifar, 2012). Risks of using Kinesiology tape include irritation and a rash. It is always a good idea to do a 24 hour test patch on the skin of a client who is concerned they might be sensitive to the tape, adhesive, or the active ingredients. Proper application of the tape reduces irritation. This tape is used the same way you would use kinesiology tape, but there are additional ingredients in the adhesive. The active ingredients typically induce the feeling of heat (some people feel a cooling sensation). The heat is produced by camphor and menthol which are the two active agents in the tape. The body has pain sensing ion channels known as TRP – transient receptor potential. Menthol and camphor are proven to inactivate the TRPA1 ion channels, decreasing the sensation of pain (Macpherson, 2006). The clinical significance of Kinesiology tape is being investigated and a lot of research is being done. Many of these studies concentrate on the pain relieving effects of kinesiology tape. A few clinical trials have been summarized below. In 2010, Kaya and team completed a study comparing the short-term effects of therapeutic kinesiology tape application on reducing pain and disability in patients with shoulder impingement syndrome compared to common physical therapy modalities. The goal of the tape was to alter the scapular muscle activity and to correct abnormal scapular position. 55 patients were split into 2 groups and treated for 2 weeks. 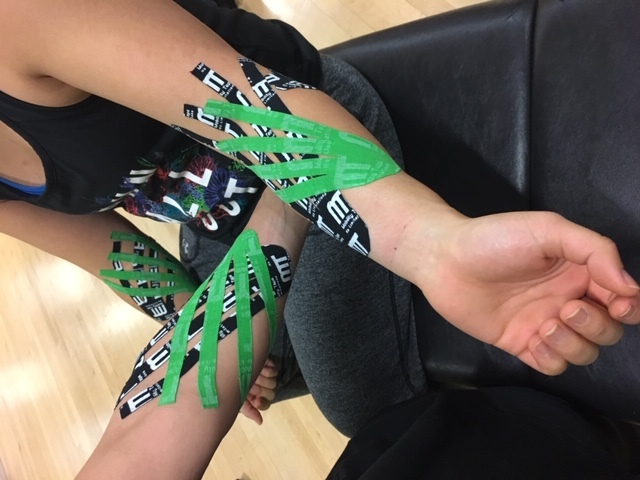 The first group of 30 patients were treated with the kinesiology tape in addition to a home exercise program (isometric exercises, range of motion, strengthening, and stretching. The tape was applied to three muscles: supraspinatus, deltoid, and teres minor. The second group of 25 patients completed a daily program of physical therapy modalities (ultrasound, TENS, hot pack) in addition to the same home exercise program. Measures were obtained at baseline and after the 2 weeks. Outcomes measured with the Disability of Arm, Shoulder, and Hand scale (questionnaire) and a 100-mm visual analog scale used to asses function and pain at night, rest, and movement. The results showed that rest, night, and movement pain scores were significantly lower in the Kinesiology taping group compared to the physical therapy group. 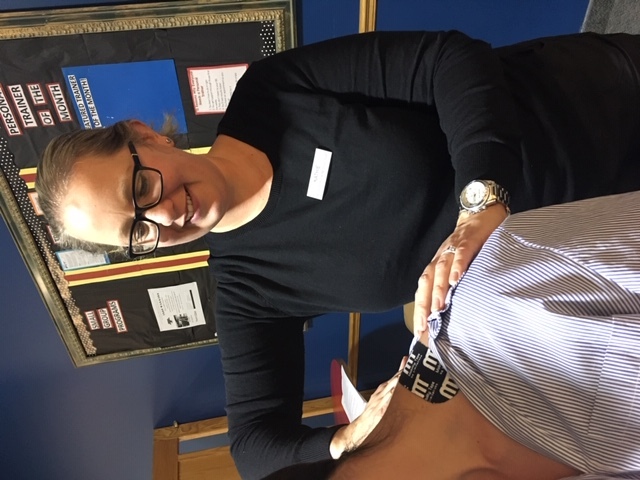 The Kinesiology taping has been found to be more effective than the local modalities and may be an alternative treatment option of shoulder impingement syndrome especially when an immediate effect is needed. Lemos and team conducted a study in 2015 to evaluate the change in muscle function induced by a kinesiology tape application with no or moderate tension, to the dominant and non-dominant arms. They were looking to see if the stretch applied to the tape would create tension in the skin to improve communication with mechanoreceptors and increases the number of motor units recruited during a muscle contraction of grip strength. 75 women aged 18-30 years old were divided into 3 groups: 1) Kinesiology tape applied with 25-35% tension 2) Kinesiology tape applied with no longitudinal stretch and 3) control group with no taping techniques. The grip strength was measured by a hand dynamometer and was assessed before the taping, after 30 min, 24 hours, and 48 hours. The first group that had the tape applied with tension, is the only group that presented an increase in the average values of each of the assessment times. A Randomised control trial was conducted in 2012 by Castro-Sanchez and team. They understood that chronic low back pain produces mobility restriction, long-term disability, and quality of life impairment and they wanted to see if Kinesiology taping could improve these conditions. 60 adults with chronic non-specific low back pain were randomly split into two groups. 30 people placed in the intervention group were treated with Kinesiology tape over the lumbar spine for one week. The other 30 people in the control group were treated with sham taping for one week. Measurements were taken at baseline, immediately after the one week intervention, and 4 weeks later. They tested using the Oswestry disability index, Roland-Morris low back pain questionnaire, pain on a 10-cm visual analogue scale, and the McQuade test of trunk muscle endurance. Results showed that at one week, the intervention group had significantly greater improvement in disability, by 4 points on the Oswestry score and by 1.2 points on the Roland-Morris score. The intervention group also had a greater decrease in pain than the control group immediately after treatment, which was maintained four weeks later. Castro-Sanchez and team concluded that the Kinesiology tape reduced disability and pain in people with chronic non-specific low back pain. The effects of Kinesiology tape in this study were small, however, the intervention is quick to apply, and does not require ongoing commitment of time and effort. Seeing that the costs and inconvenience involved are small and there is a small reduction in pain; the taping may be worthwhile overall. The research for Kinesiology tape is ongoing but there needs to be more in order to determine the substantiated benefits. Numerous studies have been concluded that take a look at the uses for kinesiology taping and right now the messages are mixed. Some studies show clinical significance of using the tape; others show more research needs to be done. When you choose to use a tool make sure you understand the benefits and risks and evaluate the best option(s) for your clients. Communicate to your clients what the tape is, how it’s used and most importantly, obtain consent from your client that you can apply the tape. Follow up with your clients at their next visit to ensure there were no issues and see if the intention of the application was achieved. Castro-Sanchez, A. M., Lara-Palomo, I.C., Mataran-Penarrocha, G.A., Fernandez-Sanchez, M., Sanchez-Labraca, N., & Arroyo-Morale, M. (2012). Kinesio Taping reduces disability and pain slightly in chronic non-specific low back pain: a randomised trial. Journal of Physiotheraphy, 58, 89-95. 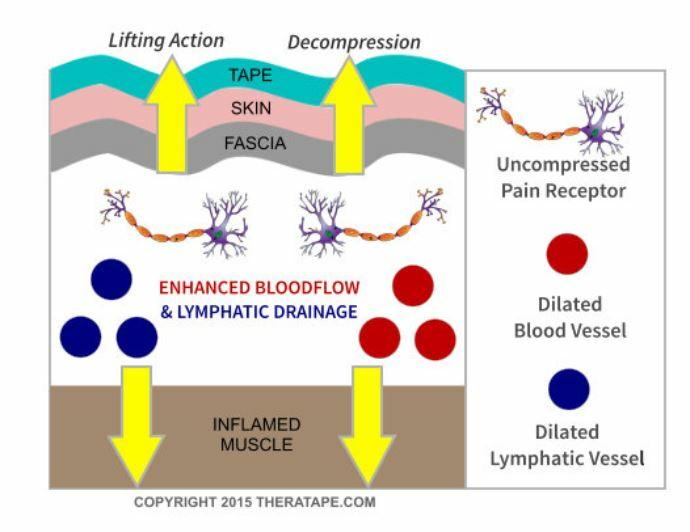 “How Does Kinesiology Tape Work.” TheraTape Education Center, 2019, www.theratape.com/education-center/how-does-kinesiology-tape-work/. Essential Competencies of Practice for Kinesiologists in Ontario, 2014 . College of Kinesiologists of Ontario. Lemos, T.V., Pereira, K.C., Protassio, C.C., Lucas, L.B., & Matheus, J.P.C. (2015). The eﬀect of Kinesio Taping on handgrip strength. The Society of Physical Therapy Science, 27(3), 567-570.